Travelling to Europe by car with the Eurotunnel Le Shuttle, means shorter journey times, a wide choice of destinations and the freedom to explore Europe by car. To highlight these key benefits and to bring the brand to life, Eurotunnel Le Shuttle teamed up with Ambient in partnership with OOH agencies Talon and OMD to deliver a multi-platform experience. The campaign was launched over the May bank holiday weekend at Bluewater shopping centre and looked to target a younger market of car owners through an engaging, digital journey experience. The activation stand featured two large tunnels with built-in screens and as consumers approached the tunnel entrance they were prompted to scan their unique Eurotunnel Le Shuttle ticket before being sent on their ‘mystery journey’ to one of four secret holiday destinations. 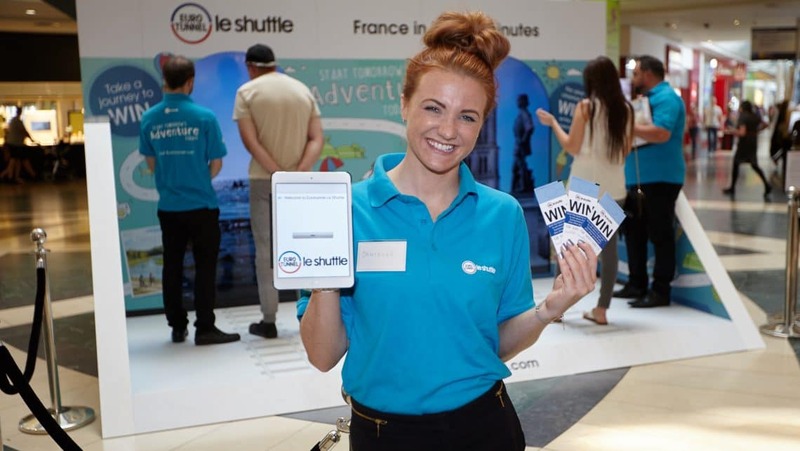 After completing their journey, customers would discover if they were the lucky winners of a range of exciting prizes, such as complimentary Eurotunnel Le Shuttle family tickets. This activation was the first project Ambient delivered for Eurotunnel Le Shuttle alongside Talon and OMD. The campaign was delivered in partnership with the Evening Standard and ran over two weeks. Close to 1,500 customers took part in the experience with nearly 200 lucky prize winners.